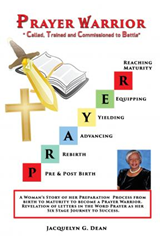 Jacquelyn G. Dean’s new book Prayer Warrior: Called, Trained and Commissioned to Battle ($10.99, paperback, 9781498488280; $5.99, eBook, 9781498488297) is an inspirational book about the author, Rev. Dean’s, life story which reveals that the journey to success in becoming a prayer warrior is a result of first becoming a Christian and subsequent yielding obedience to God’s Word, the Holy Spirit direction, correction, and perfect will for your life. Readers will gain an understanding of the spiritual battles that everyone faces and how God equips you to win the spiritual war. The book also includes an illustrative acronym PRAYER model guide to follow that will help readers move to a new level of success in their prayer life and to answer God’s call to ministry, more particularly, the ministry of prayer and intercession. The writing in this book is a true, verifiable life story experience of Rev. Dean’s triumph in spite of challenges, and her journey of faith from childhood to maturity in her spiritual growth and prayer life. Rev. Dean has proven herself to be a woman of prayer, having been Prayer Ministry Leader of her church for over twelve years, inclusive of her ordination and appointment as Prayer Pastor with responsibilities of training intercessors and prayer leaders, leading prayer services and other church prayer activities. Xulon Press, a division of Salem Media Group, is the world’s largest Christian self-publisher, with more than 12,000 titles published to date. Retailers may order Prayer Warrior: Called, Trained and Commissioned to Battle through Ingram Book Company and/or Spring Arbor Book Distributors. The book is available online through xulonpress.com/bookstore, amazon.com, and barnesandnoble.com.